I shuffle and intend for a card that will have something that speaks to everyone who reads it that month. This month’s card of the month is the 9 Swords from the Darkana deck. 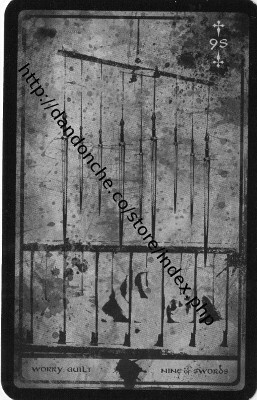 It shows a mobile of swords dangling above a baby in a cot. This card is about the ways in which we torture ourselves. We are both the swords and also the baby. We often injure or threaten injury to the most vulnerable, and often innocent, parts of ourselves, with our words and thoughts about ourselves. So, though there may not be any actual injury to be seen, we are hurt and put into a state of fear through our own negative self talk. We condemn ourselves for what we have done, or have not done, or thought about, in fact anything we can turn against ourselves. So through February our tendency to feel bad about ourselves and tell ourselves how unworthy we are is high. However this is also a month of healing – with this threat we can become aware of our hurts from many years back. Often the things we say to ourselves are internalised forms of anger about the past. We criticised ourselves or made something our fault because as a child it was easier to take blame upon ourselves than to really experience the powerlessness we felt, and consuming anger against someone we possibly also loved very much. For a small child the conflict can be too much – we would rather turn the anger to ourselves. We may have developed strategy of feeling bad about ourselves, or guilty for things, to pre-empt, and seemingly lessen the blow of criticism coming our way, whether or not it was justified. So you might find yourself feeling bad about something in order to stop the feeling of fear of punishment or criticism from someone else. With these deep, often childhood, patterns, often we don’t know they are active – we simply feel uncomfortable in some way or we feel down. Perhaps irritable with other people for no apparent reason. As these inner processes become conscious then we can take charge and heal ourselves. The situations that bring up these uncomfortable feelings can bring with them the gold of the healing of the deep, or more recent past. This month have a think about how you put yourself down, how you perhaps feel guilty about things that are not your fault, or feel guilty rather than rectify a situation you did have a part to play in (to keep that negative yet familiar feeling coming). As you become aware of how you do this to yourself – also then recognise this is a response to a very early situation – you have an opportunity to heal it. Trace it back and send love to that child you were then, getting by the best you could in the circumstances, which may have been less ideal for you, and possible for the others involved in the situation too. As you send yourself compassion you are likely to start to feel better. You can recognise in the current situation that what is happening doesn’t threaten you the way your situation of origin did – we are not helpless as adults, but have many resources available to us. We can respond in many different ways and can choose which is right for the here and now, rather than instinctively acting from the past. So you find ways to both be compassionate with yourself and also from this place find new ways of seeing the situation around you and responding in a way that serves you and is more appropriate for the present. It may simply be a case of realising you are having a go at yourself needlessly and having the courage to trust in yourself anew. The threats you feel are around you right now are not external, but reflections of your internal fears – work from this place and you can take that dangerous looking mobile down and allow the baby to continue to sleep peacefully and safely. There is no need to worry something will go wrong that is out of your control, nor is there need to worry about your performance being good enough. Use this month to unpick your past patterns of self cruelty and release the energy stored there. By the end of the month, if not before, you will have transformed this energy into an ally and know that feeling uncomfortable with yourself can lead you to great healing, and thus more joy and freedom in life to be who you are – not just responding through a taught guilt or responsibility that you don’t actually believe in, or perhaps is not even relevant any more. As part of your compassion for yourself seek out friends and professionals that you can trust to witness your process without judgement. You don’t have to heal without support, in fact seeking and asking for help can be a huge part of the new compassion you are sending your inner vulnerable self. Someone to help you take the mobile down safely. If you feel drawn to work with me unpicking your historical patterns and releasing them. I am taking bookings for personal development on a one to one basis, by phone, Skype or in person. Just contact me through my website. Also if you sign up to receive these card of the month cards by email you will be entered into a prize draw each month for a free intuitive psychic distance reading. Just send me an email saying you want to be added to the list. May you find great gold through this month and it serve you well.